Same happened to me 2 weeks ago. Tried to check the tailswitch light of one of my lights with an 18650. Had the switch been open, the light would go on. But the switch was closed and I melted the spring(s). 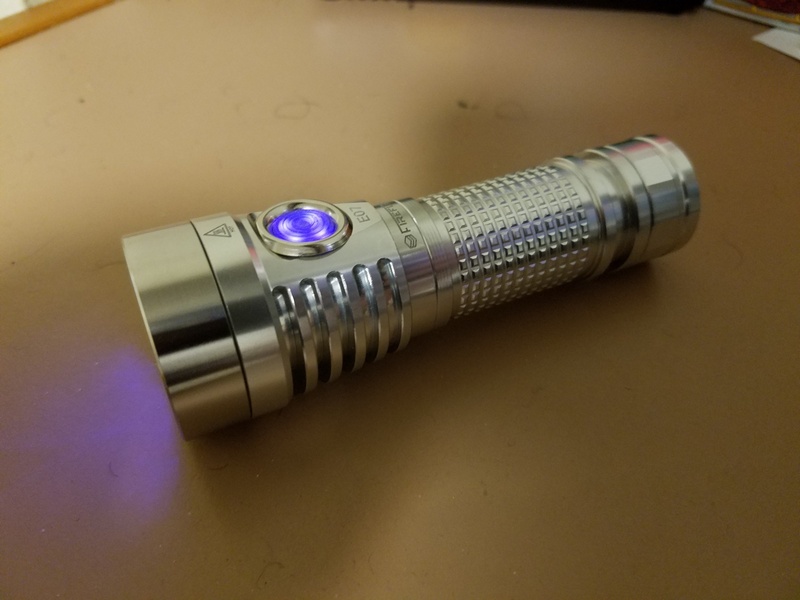 Hmm, you guys make me think about modding my old BLF SD10. It still is a nice clean design. And there’s Soshine 32650 batteries around now (this link has a feedback that measures that in a Opus charger) that measure 7000mAh and probably perform better than the old Trustfires. 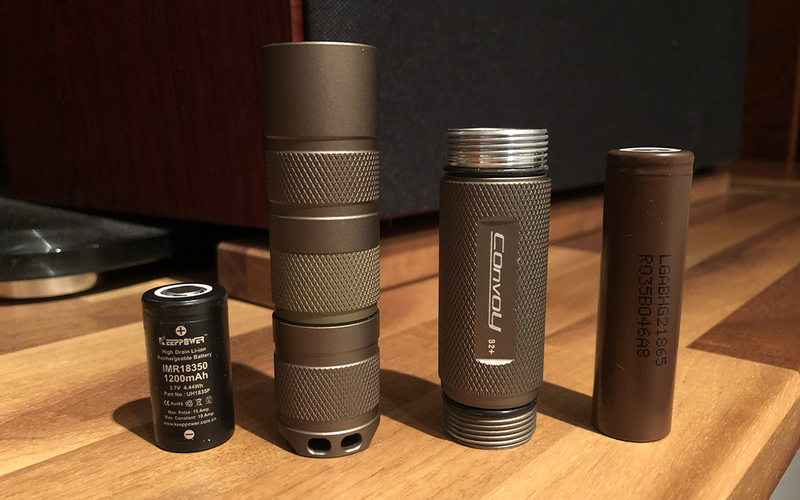 I finally received a couple of Convoy S2+ 18350 tubes that I ordered. 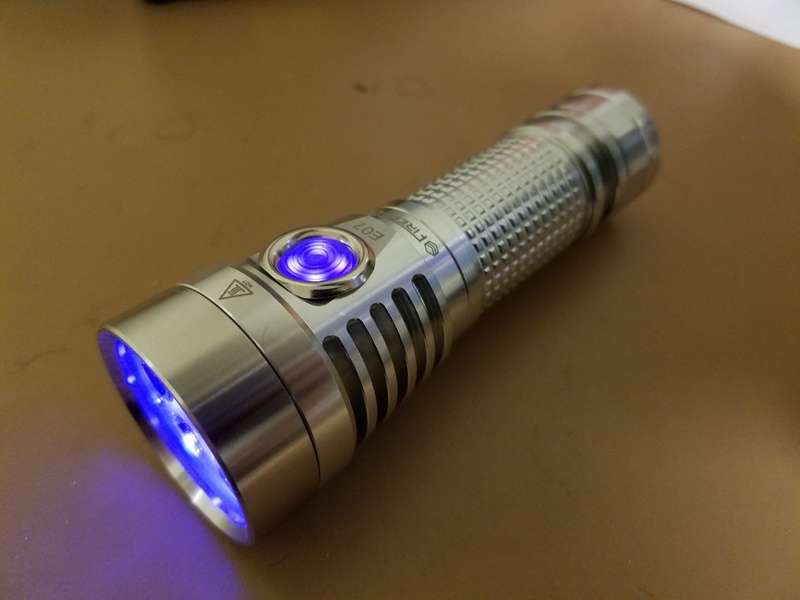 It turns them into an even more compact EDC and my Luxeon V triple still draws 14 amps from the very impressive Keeppower 18350, making it ridiculously bright for its size. I like the bolt action. Like it. I want to know how he did it. That must be so small. I smell an alien here or alien technology. Filed down a #14 nickel-plated brass finishing washer tonight. Thinking of attaching it to my clear E07. 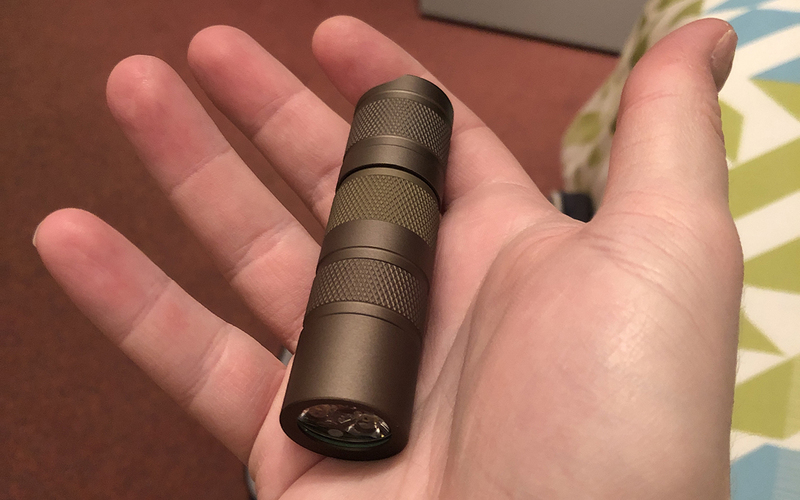 I don’t think the E07 really needs a washer to prevent accidental activation as the light is big enough it doesn’t move around in the pocket much and the button is small and flush. However, this washer would provide a little more protection and would make it easier to find the button by feel when reaching into a pocket. The washer slightly overhangs the flat part of the light around the button. If I end up gluing it on I’ll try to fill up the gap so the lower edge can’t get caught on something. 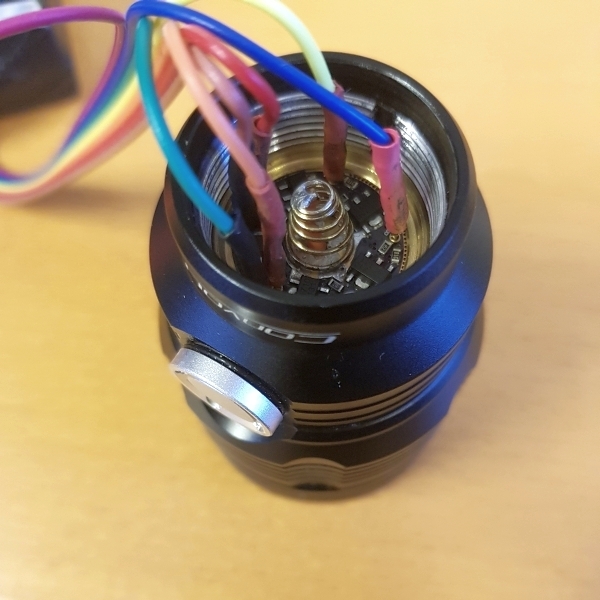 how did you take out the switch ring? That would be interesting. 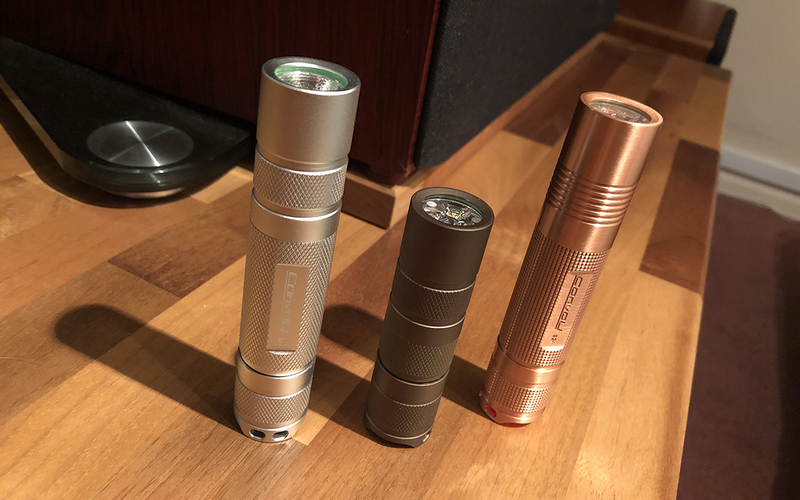 Not sure if I've seen that for a flashlight before? Are you think'n made from soft plastic that has a flexible all one piece connection between the 2 caps? That would be interesting. 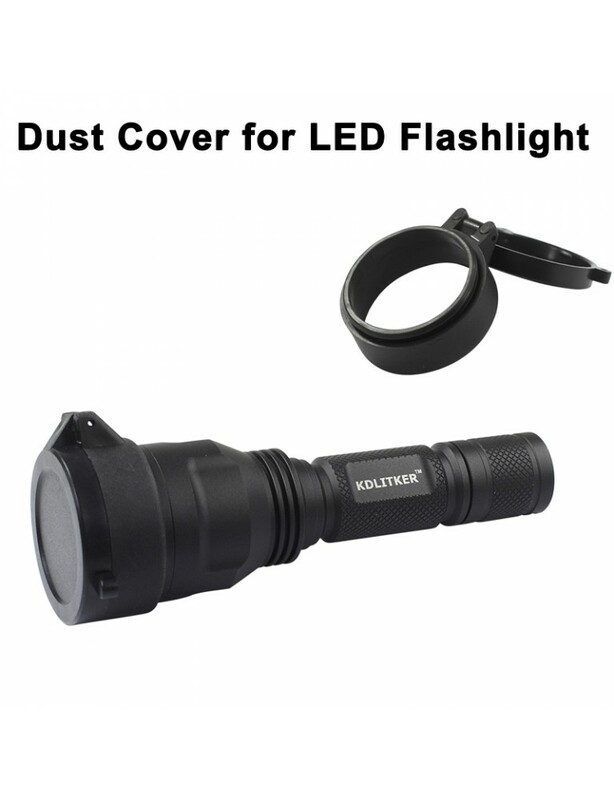 Not sure if I’ve seen that for a flashlight before? Are you think’n made from soft plastic that has a flexible all one piece connection between the 2 caps? pritty much, even PLA if push comes to a shove, end of the day there’s plenty of different velcro straps about. havent fired up the mind Blender3D yet. (costs a bit for the rubberised filoments, and then theres setting up the machine). tbh i’m surprised the torch manufactures don’t do silicon injection moulded versions, is a very short design step. My idea is to use a diffusion film on the cover to change the beam of a GTmini from throw to flood. But I think DC fix is not enough. I need more a lens structure or pebbled on it. I suggested this in another thread I think DC Fix will be enough, have you tried? Every time I have used DC Fix on a thrower it totally kills the hotspot. It wont give you a super wide beam but it will blend the hotspot into the spill quite a bit. No, I need the light first, then I can measure and order a cover. Do you plan on putting the DC Fix over a 2nd piece of glass? It’s pretty thin. There are more thick “vinyl” feeling alternatives that may work better if you dont use two pieces of glass. 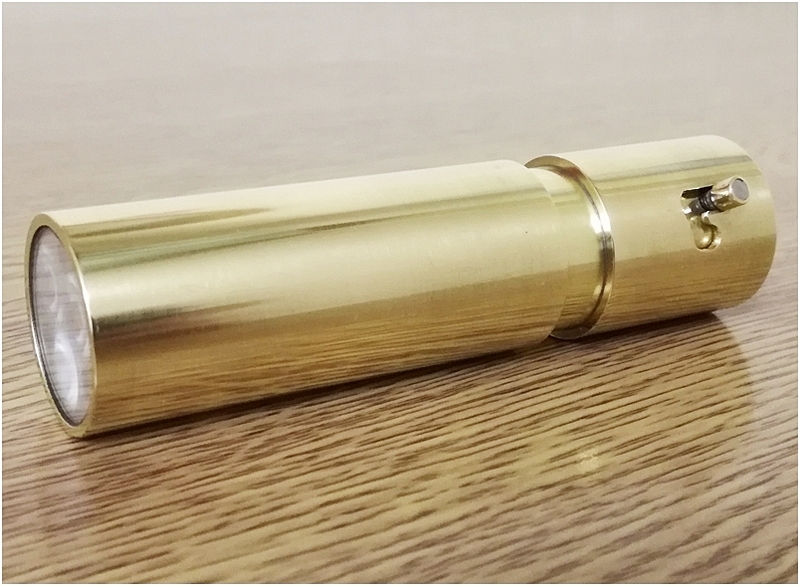 I got one of these same covers from Kaidomain for my Jaxman Z1, they are pretty cool. Totally mind boggles me why someone would buy a light designed for throw then go out of their way to kill the throw…why not just buy a different light? He’s going to put the DC Fix on a lens cover. Dual purpose! Ah yes, so much better… make a purpose built small light large and bulky. 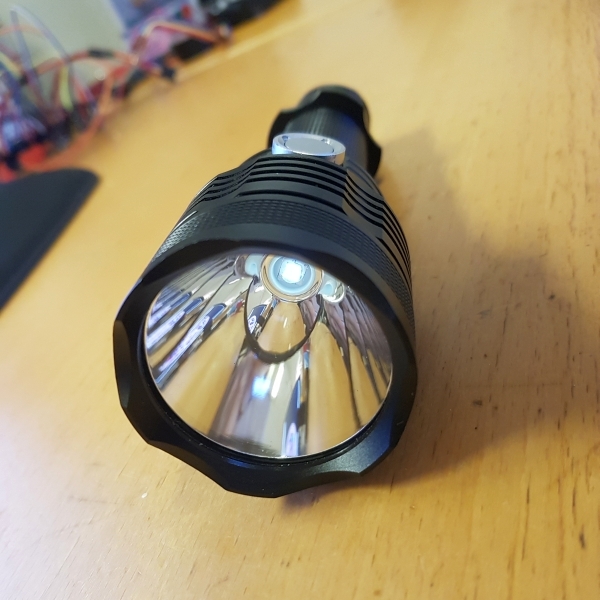 However, if it was some magic magnifier than increased lumens 2% you would be all for it! And small and light is in my terms 16340. For me the mini is already big. I need a dual switch light for testing all switch combos my drivers and firmware support. I’ve had a L4 laying around hardly used for ages so why not give it new life as a driver firmware testing unit. My drivers are 17mm though, so I made a specific version for the L4 with integrated E-switch. As it’s bigger I can fit more regulators on it, so I now have full constant current PWM free ramping from 0.05 amps up to theoretically as high as 8.5 amps. The only LED I have around that can handle up to 8.5 amps is the SST-40 so that’s what I used. So, now I finally have a test unit. I need one because testing on a bench platform is not the same as using a real light. those capes are handy for colour filters. Nice Mike C! Would this work as e-switch only? How's the parasitic drain? I got lots of questions, but mainly what's the MCU? Beautiful driver MikeC, did you use a script for those vias or place them all by hand?! 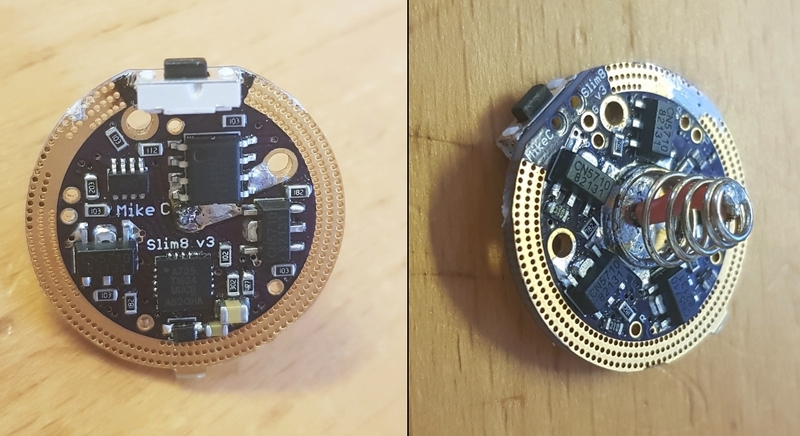 I’d say I’d try to use that method (Cu ground ring with lots of vias) next time I need to size up a driver quickly but I’d never get that many vias aligned that well. That’s a piece of art! Nice Mike C! Would this work as e-switch only? How’s the parasitic drain? I got lots of questions, but mainly what’s the MCU? Thanks guys! Cereal_killer is correct. I use the ATtiny1634. Drivers and firmware support off-switch, E-switch and dual-switch. Same firmware, no need to re-flash, which is why I need a dual switch light for testing so I can test it all. I have a switch configuration setting so I can change on the fly. I haven’t tested parasitic drain with my better DMMs. I just tested with the one I have here and it’s undetectable, but I’ll test some tine during the weekend with my better DMMs. When I built 7135 and CAT4104 based drivers I got it down to 0.1uA with OTSM compatible drivers, but I need to test with my better DMMs when using these new regulators. They will have some sort of shutdown standby current, hopefully really low. Datasheet only specifies a max shutdown current of 1uA, no typical or minimum shutdown current. To keep parasitic drain to minimum I power the digipot directly from a MCU pin, and the negative side of the voltage divider doesn’t go to ground, it also goes to a MCU pin so that I can switch off GND for the divider. On of the benefits to having a lot of pins to play with I don’t actually need the voltage divider for 1S but I use it for OTSM power off detection. I use a script. Placing them all by hand would be horrible! I’ve deleted a few vias though, as I routed some signal paths out in the GND ring area. K, thanx! Might be asking you more bout this, but on the dedicated thread - I'm subscribed now.